With over 6 inches of rain in much of the Fort Worth area, the Trinity River has swollen to cover the low water crossings of the Trinity Trails. Based on hydrologic data from the National Weather Service, the Trinity peaked at about 5 feet above normal flow levels at downtown Fort Worth. Past experiences with high river levels indicates that low areas of the trails will be covered with debris. 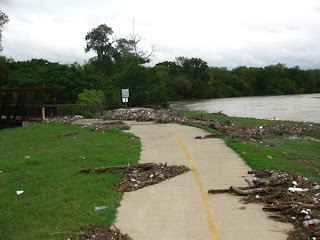 A great blog post, with many good photos (including the one below), at the Durango Texas Blog, shows the effect of the Trinity River on the Trinity Trails at Gateway Park. Remember, that the low water crossing icon on our interactive trails map indicates locations that will be impassable until river levels return to normal. UPDATE: We now have more complete coverage of the storm's effect on the Trinity Trails. Trinity Trash Bash This Weekend!